This is a recipe from one of my old Food & Wine cookbooks. It’s perfect to serve for a luncheon, as I did yesterday with my husband’s two beautiful nieces. The ladies insisted it was good enough for this blog (I have such high publishing standards here, you know), so I snapped a quick picture. This salad is the rare combination of light yet substantial: low in fat, high in flavor, and decent nutritional value. The one thing I might do differently is add a bit more red pepper flakes, or perhaps even some freshly diced hot peppers, assuming my fellow diners liked things hot. I have found it’s worth the effort to shred the cabbage in the food processor rather than just use a bag of cole slaw, but if you’re short on time or lacking a food processor, bagged cole slaw will do just fine. Cut each chicken breast into five diagonal strips. In a medium saucepan, combine the broth, 1/4 of the scallions, and 1/4 teaspoon of the salt. Bring to a simmer, add the chicken, stir, and cover the pan. Cook over low heat for 5 minutes. Turn the heat off and let the chicken steam for 5 minutes. Remove the chicken from the pan and shred it. In a large bowl, combine the shredded chicken, the remaining scallions, the cabbage, carrots, and 4 tablespoons of the herbs, if using. In a small glass or stainless-steel bowl, whisk together the lime juice, soy sauce, sugar, red-pepper flakes, and the remaining 1/4 teaspoon salt. Toss the salad with the dressing. Sprinkle with the remaining 2 tablespoons chopped herbs and the peanuts. 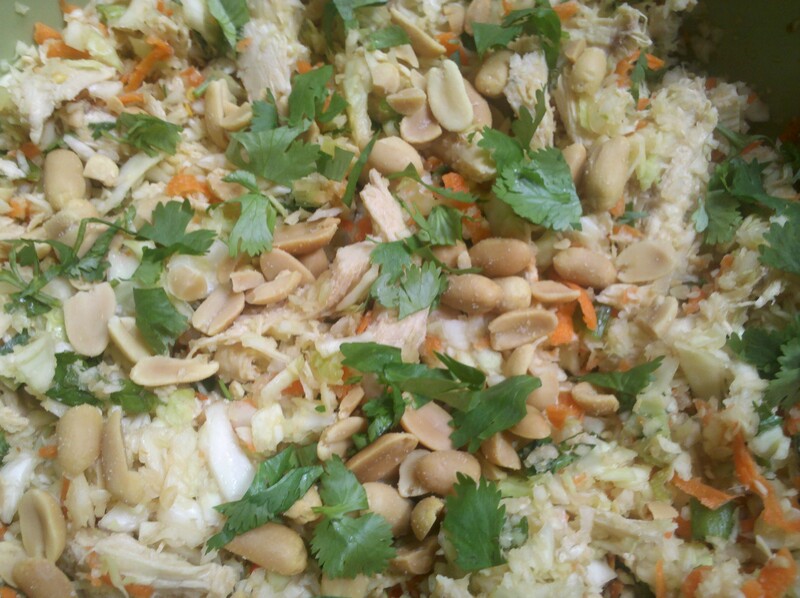 This entry was posted in Chicken, Main Dish, Salads and tagged cabbage, chicken salad, gluten free, luncheon, Vietnamese by Mom Mom's Apron. Bookmark the permalink. Oh this sounds perfect! A perfect use-up-the-chicken dish, too. Do you think it would ruin it if I subbed cashews for peanuts? No, not at all, Claire! I think if anything cashews would even make it better. They can get soggy, though, so save some fresh ones to mix in with the leftovers. Let me know what you think. Hey Dawn, I made this for a parent potluck last Saturday. I chose it because I needed to take something gluten free so *I* would have something to eat. It got rave reviews, and I was glad something safe was on the table. Thanks! Gretchyn, I am so glad to hear this! And thank you for the reminder to tag some of my recipes as GF.